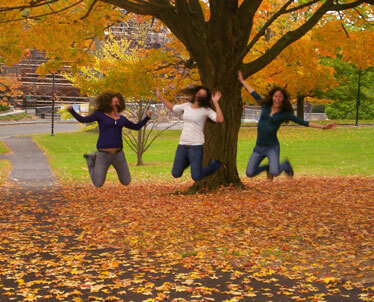 Hawaii students Kira Johnson (Hawaii Preparatory Academy '06), Amanda Ross (HPA '07) and Kim Nichols (Konawaena '07) frolic in the leaves at Mount Holyoke College. AMHERST, Mass. » During my morning walk under fall foliage, two turkeys bolt from the brush, cross the road and join a half-dozen others pecking for breakfast on someone's lawn. In the distance, geese honk raucously before they resume their southerly migration. A footbridge takes me across the Fort River, gurgling congenially on its way down to join the Connecticut, and onto a forest-flanked bike path where a college-age jogger speeds past. But I'm in no hurry. Autumn doesn't get any better than this. About 90 minutes west of Boston and three hours northeast of New York, this scenic section of New England offers a wide array of outdoor attractions and activities. But the Pioneer Valley is also an ideal destination for parents and teens scouting colleges. There are five here, part of a collaboration that allows students at one to take classes at all. The so-called Five Colleges also share libraries and theater casting calls. Free buses link the campuses. Amherst College, the oldest (co-founded by Noah Webster of dictionary fame), is ranked by U.S. News as the No. 2 liberal arts college in the country. Two others, Smith and Mount Holyoke, are among the nation's top colleges for women. Hampshire College, the newest, is also the smallest, with 1,350 students. Compare that with the 25,600 students who attend the Amherst campus of the University of Massachusetts. 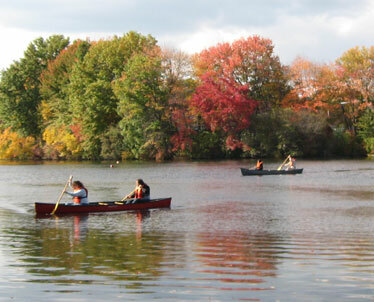 Autumn hues were evident in October as canoe paddlers plied the waters of Upper Lake on the campus of Mount Holyoke College in South Hadley, Mass. The Connecticut River Valley in western Massachusetts, home to the so-called Five Colleges, offers a wide array of outdoor activities. Massive UMass is also the bargain of the bunch, with tuition and fees (for nonresidents) roughly 40 percent less than at the more exclusive private schools. In short, there's something for everyone here. Eunice Ko, a 2005 Iolani School graduate, says Amherst College is her "dream school" as she pursues a degree in neuroscience. "I first visited Amherst on the Iolani college tour as a junior," she recalls. "I was looking at very good schools that week, but at Amherst I felt something special. It was a gut feeling of belonging. ... Now, at my third year at Amherst, I still love this school. I love the freedom of not having a core curriculum, and I relish the opportunity to try the hundreds of new activities that are offered here." Ko says she enjoys social events at the other campuses, and sang last spring in a Five Colleges concert at Smith. Selena Chang, a 2004 Sacred Hearts Academy graduate, likes Smith's liberal-arts emphasis. "Smith provides an amazing experience here for students," she says. "Being able to take courses in all disciplines allows students to think from all different points of view. I'm an economics and government major. However, I have taken courses in astronomy, literature, math, design, and golf and springboard diving." She also took a UMass Spanish class. Across the Campus Pond, the 1880s-vintage Old Chapel reflects the morning sun at the University of Massachusetts at Amherst, with misty fields and hills in the distance. At Hampshire, Lani Gedeon enjoys the freedom to design her own major, called a "concentration," without any tests or grades. "Instead of grades we get written evaluations, which are much more useful, to me at least, and in place of tests we have papers, final projects and presentations," says Gedeon, a 2005 graduate of Punahou School. "Classes are small and very discussion-based, leaving students with much more personal attention and allowing for continual active engagement. I have started a student group for environmental sustainability, which has been amazingly successful here. The great thing about Hampshire is that there really is opportunity to make a difference." Hampshire senior Drew Goldsman, a graduate of Island School on Kauai, says, "Without the Five Colleges, Hampshire would have a difficult time meeting some students' demands. I took more than half of my classes off campus, which was great, although at times I feel that it has left me a bit of a stranger to many Hampshire faculty." With ivy-covered buildings, expansive lawns, lakes and stables, Mount Holyoke is rated the nation's fifth most beautiful college campus by the 2008 Princeton Review. Junior Valerie Galluzzi, a Punahou graduate, says she applied mostly to women's colleges because her mother is a Mount Holyoke alumna. She was accepted at several but chose Mount Holyoke because she "liked the campus, location and, most of all, the attitude of the students and staff." She has taken physics and calculus at UMass. "It was interesting because the class sizes were larger and there were more men than women -- obviously a change from my classes at Mount Holyoke." 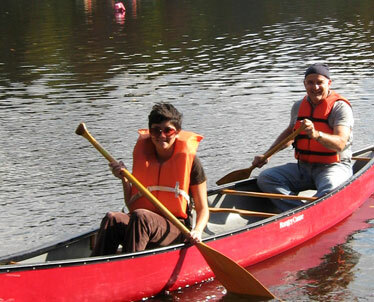 Jim Borg, Star-Bulletin assistant city editor, paddles a canoe with his daughter, Mount Holyoke senior Rachel Borg (Punahou '04), on the campus' Upper Lake. Sophomore Cu Ri Lee, a 2006 graduate of Pearl City High, says Mount Holyoke offers internships and other opportunities that larger schools might not. "I was able to volunteer in Panama this past summer through a program my Spanish teacher recommended," she says. At UMass, senior Kelsey Okuda, a Hilo High graduate, says: "New Englanders are stereotyped as cold and snobbish, but my personal experience showed a different crowd that made me feel more cozy here than back home. "But I think the biggest driving factor for students to come out to New England and especially the Pioneer Valley is the reputation of the schools in the area," he adds. "Amherst, Smith, Mount Holyoke have reputations that speak for themselves. UMass' Isenberg School of Management is one of the top public business schools in the country, and the Hotel and Tourism Management Program is internationally renowned." 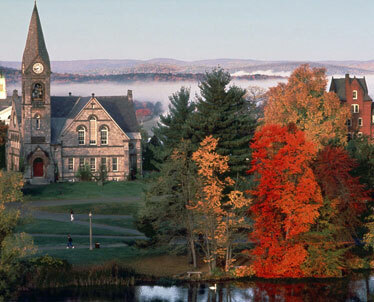 Students at the Five Colleges also enjoy the shops, cafes, restaurants, theaters and galleries in Amherst (pronounced without the h) and Northampton, named the No. 1 U.S. small town for the arts by AmericanStyle magazine. "I like to go out to dinner in Amherst and Northampton," says Galluzzi. "I also go shopping in Amherst because the CVS there is the easiest to get to via bus. I bought my favorite winter boots in Northampton." Yes, winter is on its way. But for now, red, brown and yellow leaves beckon college-bound students, their parents and tourists for an autumn adventure with an academic, artsy ambience. Jim Borg is an assistant city editor at the Star-Bulletin. Here are fast facts on the Five Colleges, located in the scenic Pioneer Valley north of Springfield, Mass. Students at one college can take classes at any of the others. Smith and Mount Holyoke also belong to the so-called Seven Sisters group of women's colleges. » Connecticut River Greenway State Park: One of Massachusetts' newest state parks, the Greenway connects open spaces, parks, scenic vistas and archaeological and historic sites along the length of the Connecticut River as it passes through the state. There are more than 12 miles of protected shoreline and numerous access points to the river for canoeing, fishing and picnicking. » Norwottuck Rail Trail: In Connecticut River Greenway State Park, the 10-mile Norwottuck Rail Trail traces a former railroad right-of-way through Northampton, Hadley and Amherst. The trail is ideal for cyclists, skaters, walkers, runners and cross-country skiers. Cycle and skate rentals for the trail are available in Northampton on Damon Road across from the Elwell Recreation Area. For more information on rentals, call (413) 545-5353. » Holyoke Range: A 7-mile ridge stretches from Hadley to Belchertown with trails for hiking, horseback riding and cross-country skiing. » Summit House: In the 400-acre J.A. Skinner State Park, this mountaintop retreat, a popular hotel in the 1800s, offers grand views of the Connecticut River Valley. The summit is accessible by road from April through November, and by hiking trails year-round. Reportedly a nice spot for lunch, but can get crowded. » Atkins Farms: On Route 116 near Hampshire College, this popular market offers some of the best fresh and freshly prepared food around, including pies and cider doughnuts. Usually crowded on weekends. » Emily Dickinson Museum: In Amherst, the Homestead is the birthplace and home of poet Emily Dickinson, who briefly attended Mount Holyoke. The museum, opened in 2003 as part of Amherst College, also includes the Evergreens, home to Dickinson's brother Austin and family. » Magic Wings Butterfly Conservatory & Gardens: In South Deerfield, this is home to 3,500 free-flying butterflies from around the world. » Six Flags New England: Just south of Springfield, Six Flags is the region's largest amusement park, with lots of rides, including the Superman Ride of Steel, billed as the mother of all roller coasters.